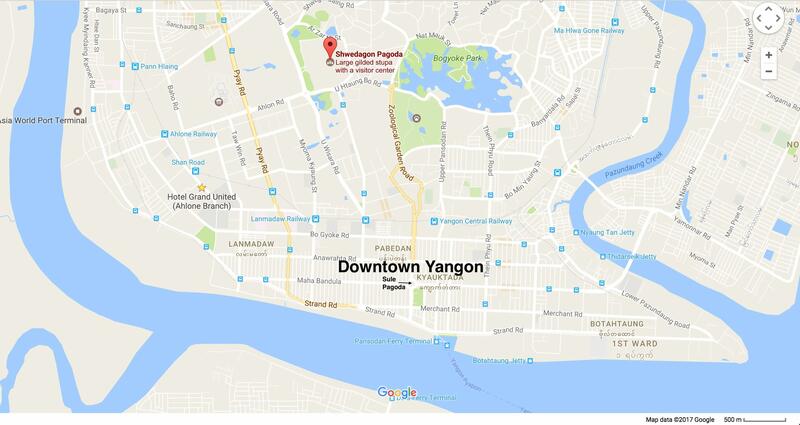 If you visit Myanmar (formerly called Burma), you will probably be starting off in its largest city, the business and cultural capital Yangon (Rangoon to the British). 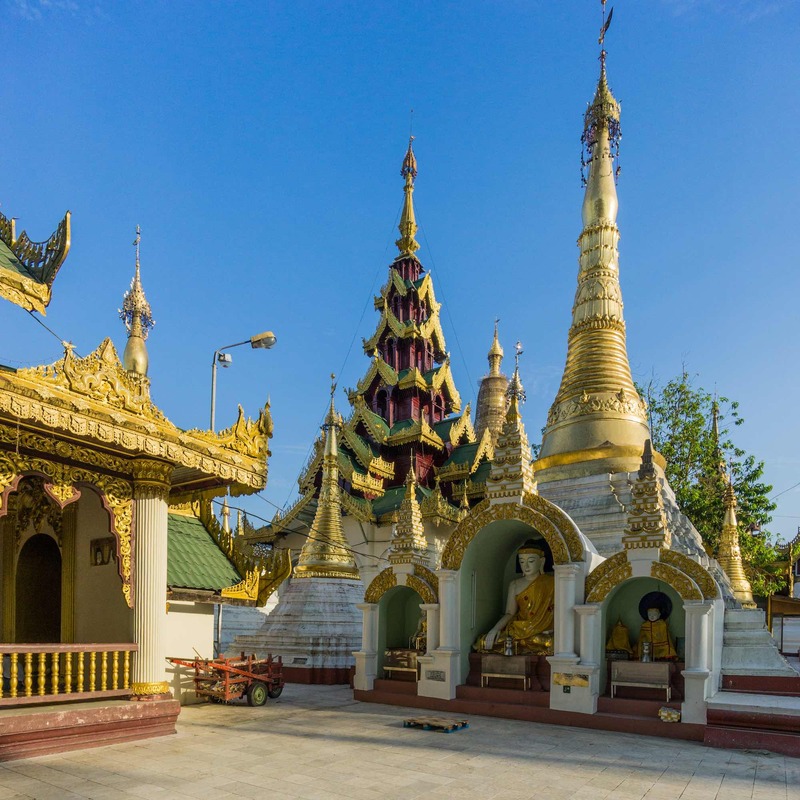 At the very top of the list of “must see and experience” sites is the gold-covered stupa or zedi to the north of the downtown area. I have had a lifelong fascination with spaces considered sacred and have always sought them out in my travels. 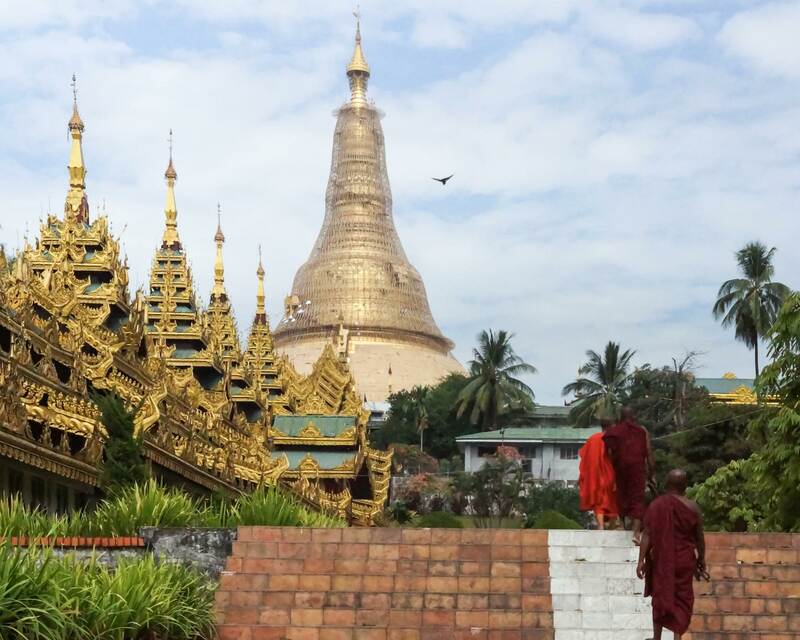 Yangon’s Shwedagon Pagoda stands out as one of the most amazing I have been lucky to get to. You know you’re in a special place when you even inhale more deeply as you walk around and take it all in. 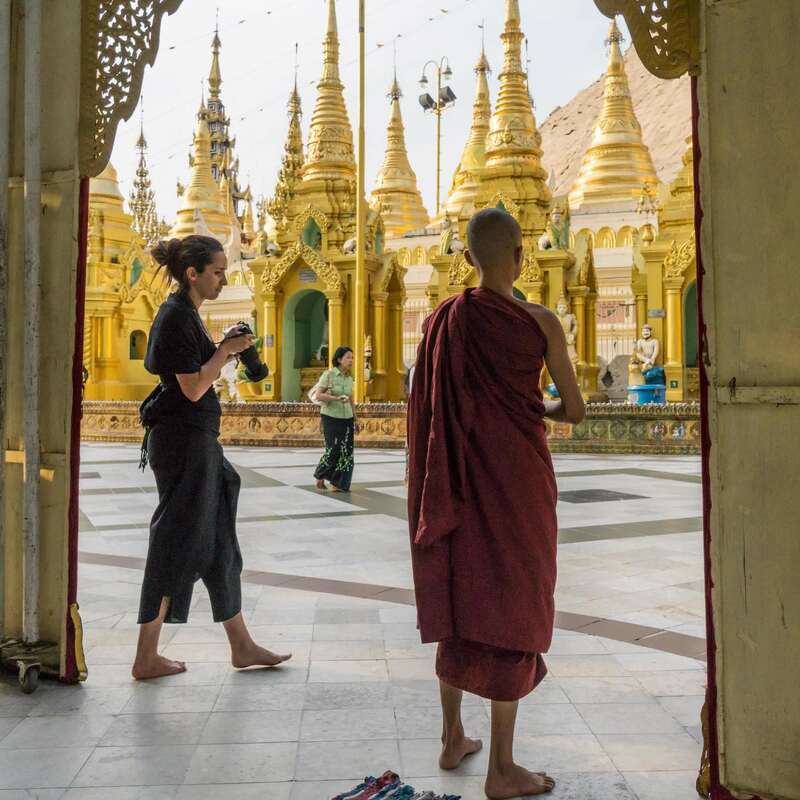 In the few days I had to spend in the ramshackle but still enchanting city, I visited the Shwedagon three times, drawn back by the energy and beauty of not only the shrines and the statues but of the thousands of Buddhist devotees and others who walked with me around the stupa. 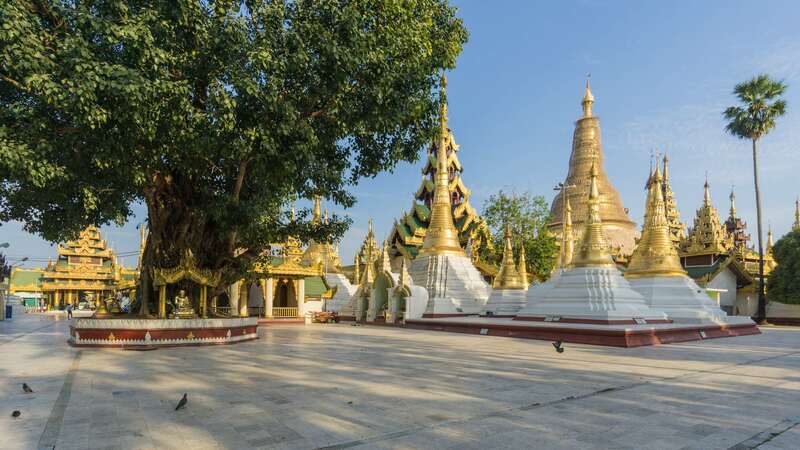 Shwedagon is the epitome of the architectural elegance and perfection of all Buddhist stupas as no other stupas in Myanmar and Asia can surpass its design ingenuity and extravagance. One can certainly appreciate its soaring golden spire glowing mysteriously against the deep blue sky, saturated sunset, and dark night and it is easy to imagine why this zedi is a national monument. 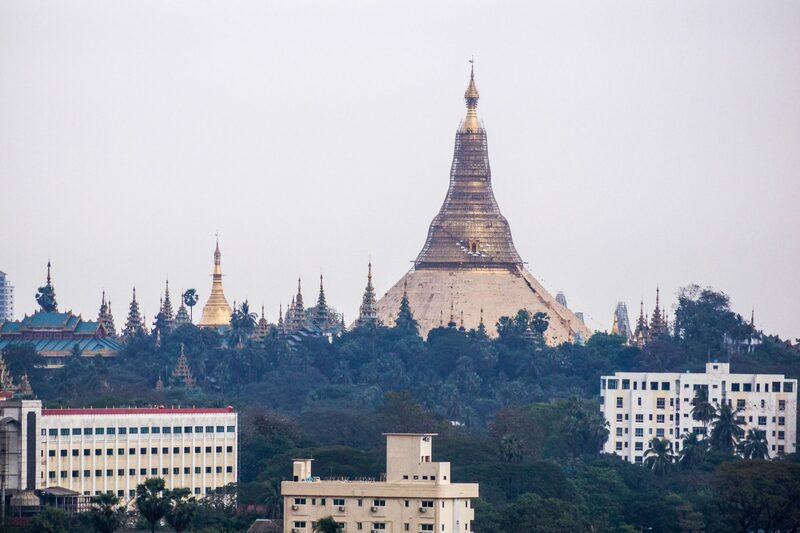 My first look at the Shwedagon came from the 12th-floor window of my room at the Hotel Grand United, some three kilometers to the south-west. 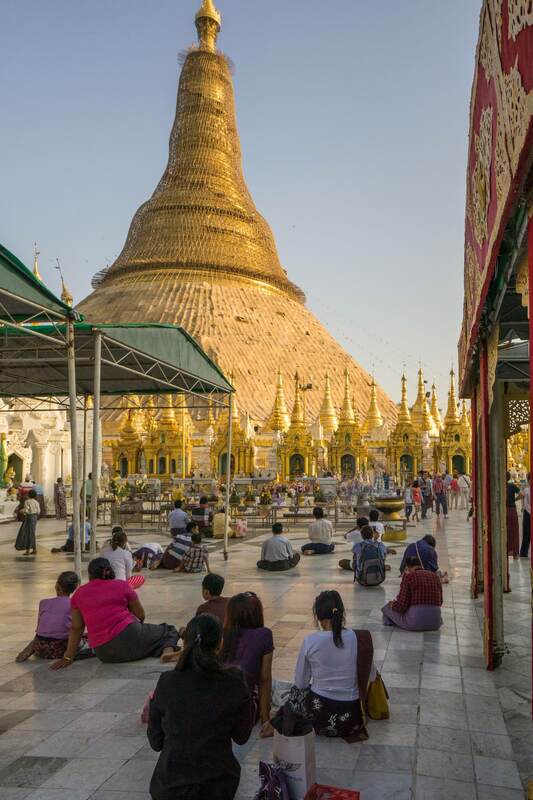 In the photo above the Shwedagon (105 m or 344′ high) is in the foreground; in the back and to the left is the Naungdawgyi Pagoda 46 m), a scaled-down version of the central zedi (Burmese term) or stupa (Sanskrit term). 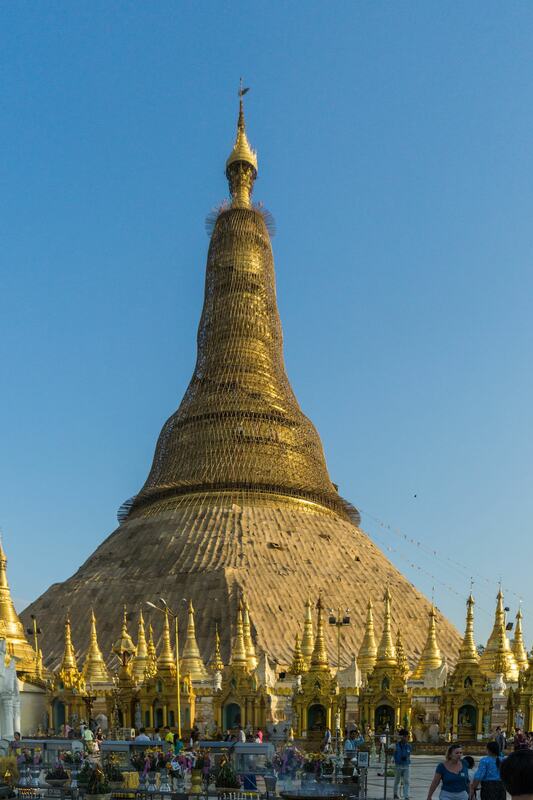 I still am not clear why we insist on calling it a pagoda since it doesn’t look at all like one! 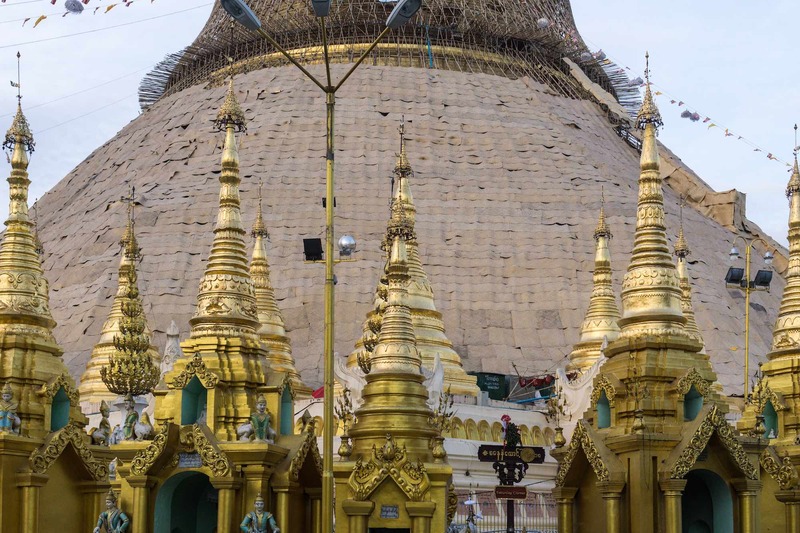 One thing to note about my images of the Shwedagon stupa itself – they lack the glow given off by the tons of gold leaf and plate covering the stupa face. How much gold? Google the question and you come up with the following tonnage – 6, 27, 60, 90! Let’s just say – a lot! As karma would have it, my visit coincided with the once-every-five-years regilding of the surface so during my visit, and for a couple of months before and after, all that visitors got to see was the bamboo matting and scaffolding. Too bad – and yet there still seemed to be a glow emanating from the surface! 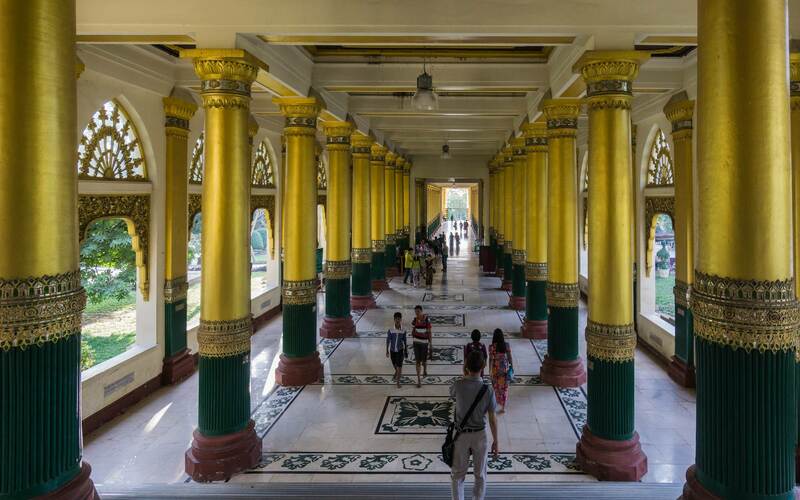 As with a number of other zedi complexes in Myanmar, the Shwedagon has four entrance halls, one at each cardinal direction, leading up to the main terrace. The half-dozen images that follow show a couple of the exteriors of a couple of them. 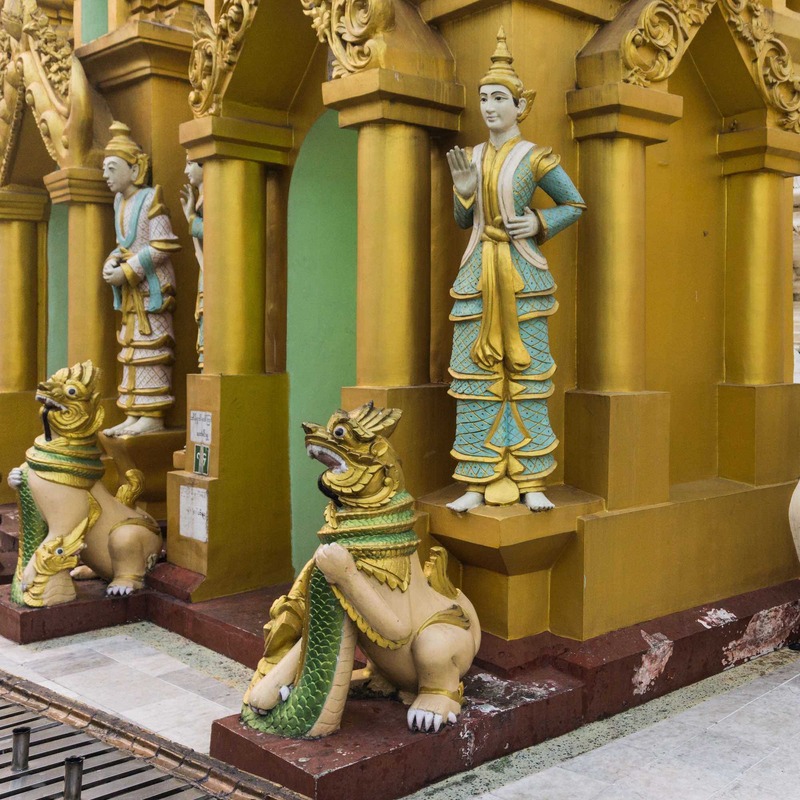 At the entrance stand two colossal lion-like creatures known as chinthe whose task is to guard the pagoda. One entrance – the southern – was noteworthy for its lack of vendors’ stalls selling devotional items and the flower offerings which devotees take to various major shrines and the eight planetary posts. Near the entrance are shoe attendants and a large rack area where you will leave your shoes until you return. Finding my way back to the right entrance was one of my unexpected challenges on the first visit! 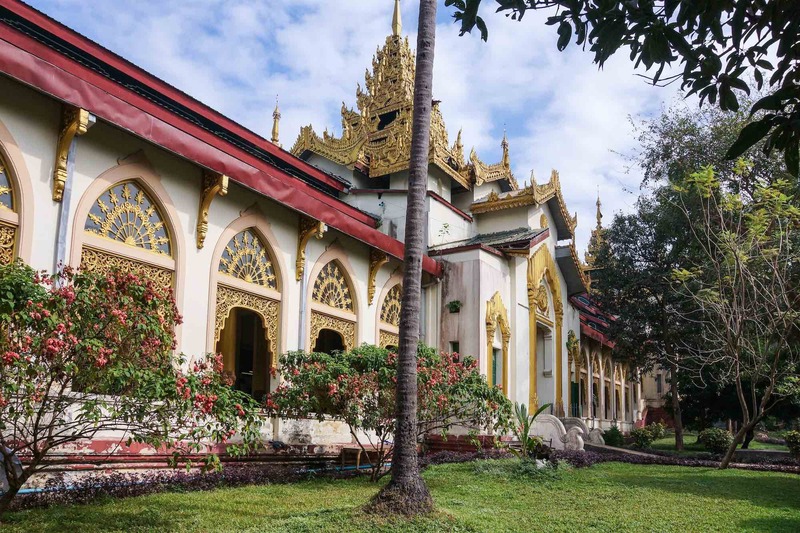 Around the exterior of the pagoda area are a number of gardens and monasteries with a number of full-time monks and nuns in attendance. 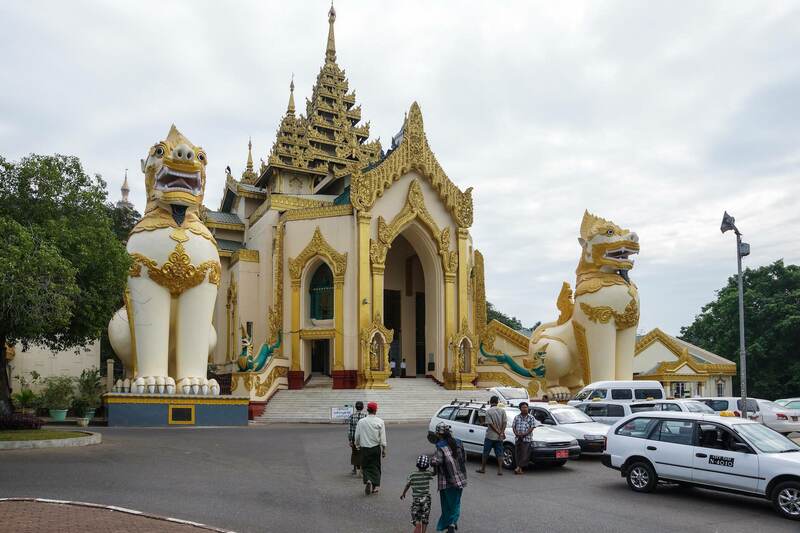 For a Burmese Buddhist who accepts the Shwedagon story as fact, this is the Ground Zero of their faith. The hill on which the stupa was built is said to contain the relics of the three Buddhas who came immediately before Siddhartha Gautama of the Sakya clan, the historical Buddha. When you add to these sacred objects – a staff, a water dipper, and a bathing garment – the relics from the fourth Buddha of our age, you clearly have a locus of immense spiritual power. Sakyamuni psychically understood King Okkalapa’s devout wish and conveyed the vision to the two merchant brothers in Okkala named Tapassa and Bhallika, who then immediately set out to India to obtain the relics. 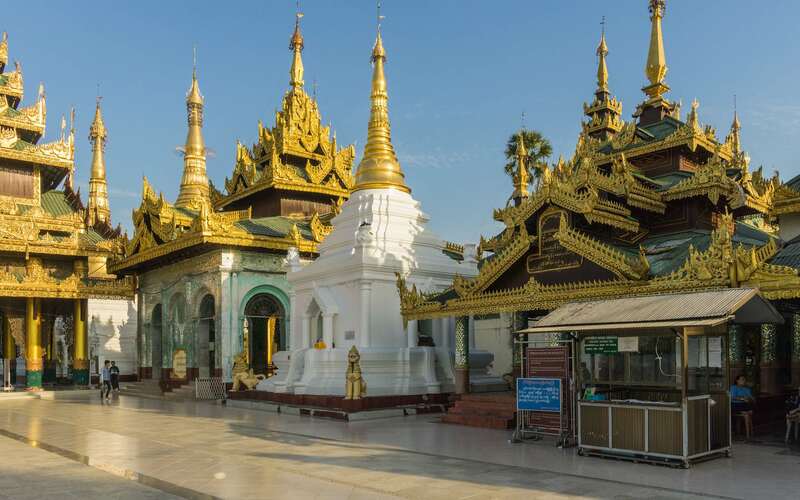 During their meeting, Sakyamuni gave the brothers eight hairs on the fifth day in July 532 BCE or two months after his Enlightenment in Bodhgaya; these would be later brought back to Myanmar and interred in a stupa on the Shwedagon Hill. 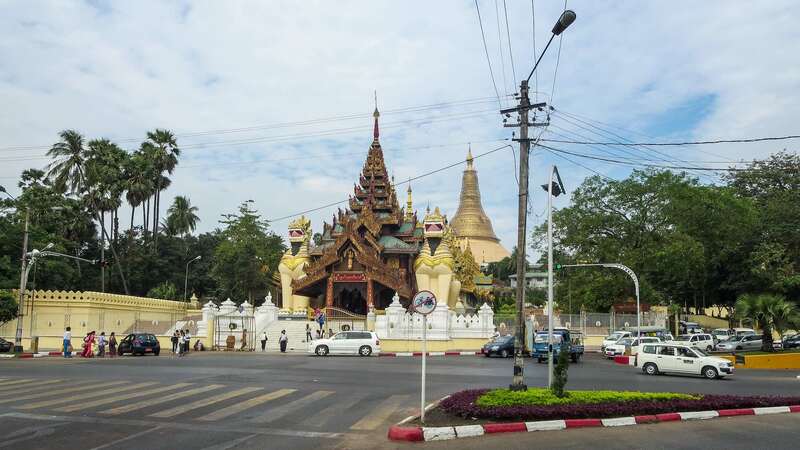 The Southern Entrance to Shwedagon – no shops! 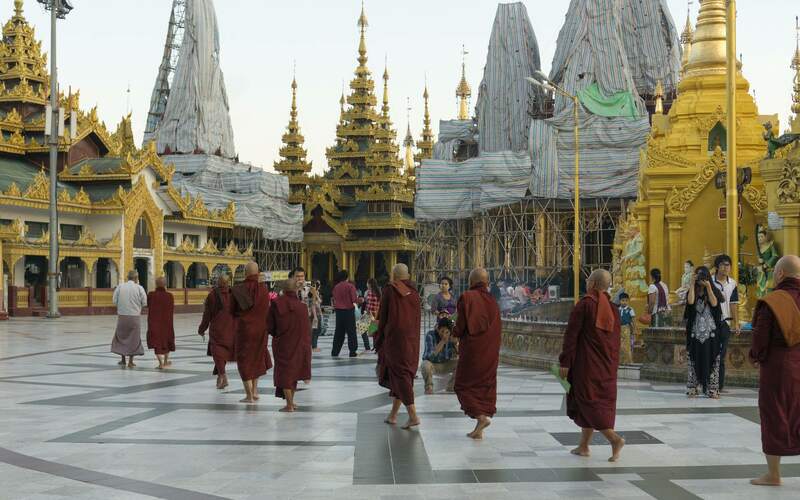 Shoes surrendered, entrance ticket in hand – it was finally time to explore the main terrace of the Shwedagon complex. 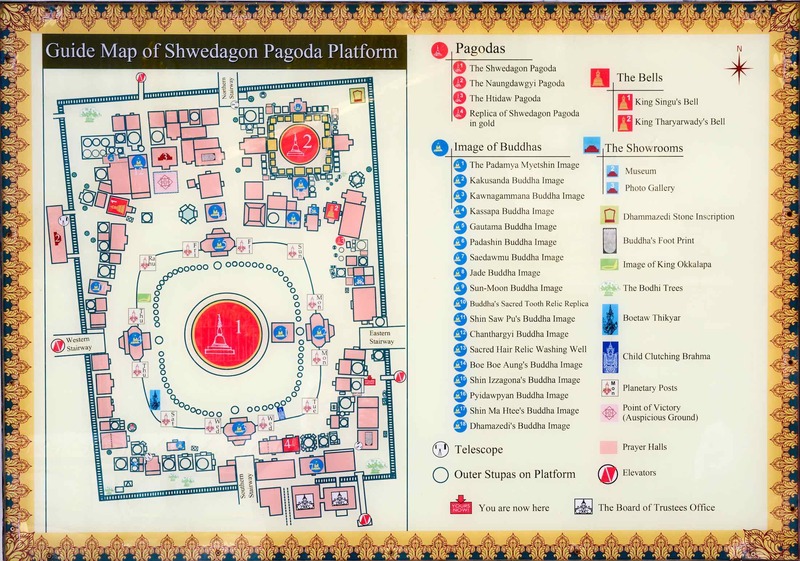 As the floor plan below makes clear there is a lot more on the terrace than the stupa – perhaps too much! 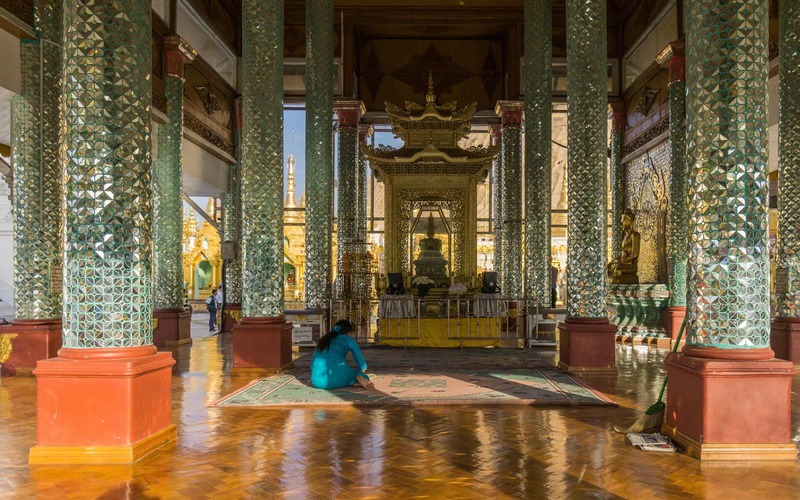 Over the centuries wealthy patrons have added pavilions and shrines around the perimeter of the stupa. Their intent was clear – to earn extra merit in this lifetime and thus ensure a better rebirth in the next. The result? Here is W. Somerset Maugham’s write-up after a visit he made in the 1920’s! 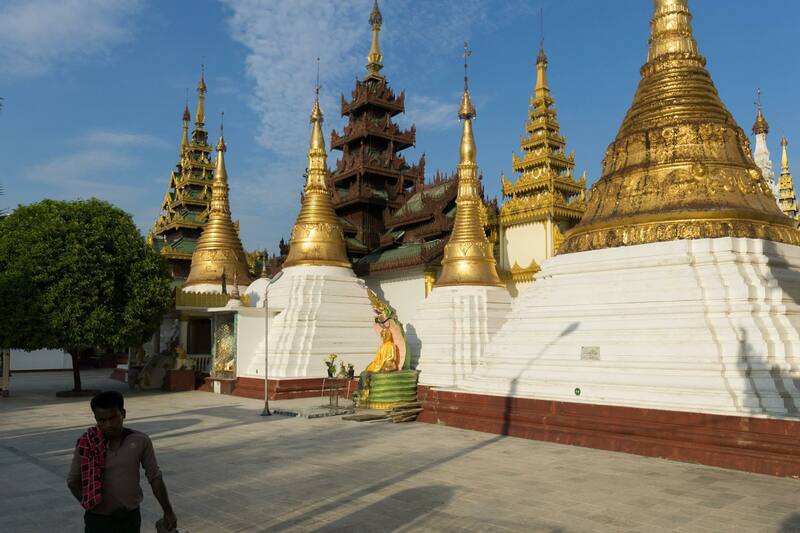 On a later visit to Myanmar’s tallest stupa, the Shwemawdaw Pagoda in Bago (Pegu), I found a terrace free of the jumble of shrines that one gets to walk by at Shwedagon. Remembering instructions given at the great Tibetan Buddhist stupa at Boudhanath near Kathmandu, I made sure to walk around the main terrace in a clockwise direction. 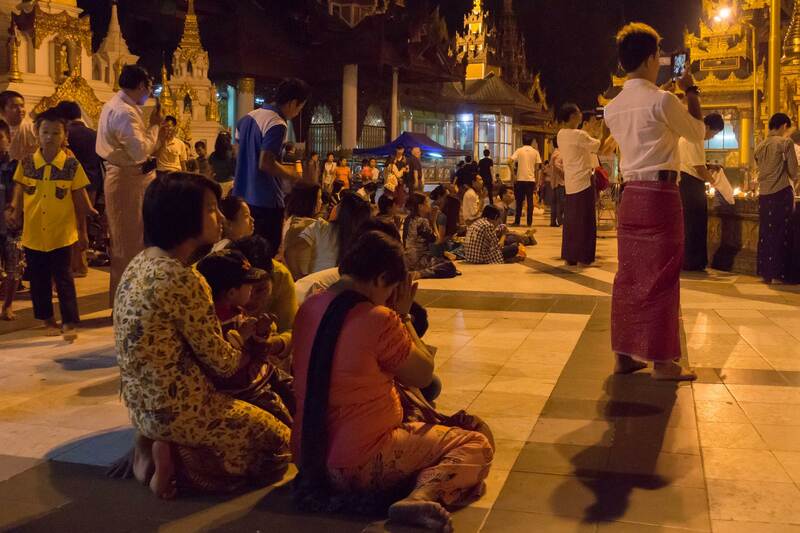 Given the number of local visitors walking towards me, I had to conclude that to Buddhists in Myanmar this is not a mandatory thing! Perhaps other rituals – like the one about never having the bottoms of your feet pointing at the Buddha image or statue – are more important. 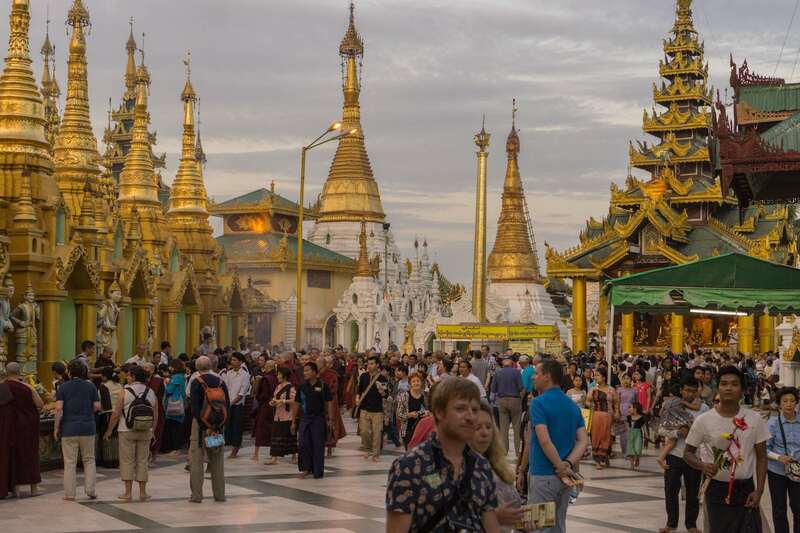 Shwedagon – in the middle of a major regilding job! From my youth as a Roman Catholic Christian, I remember the belief in indulgences, those beneficial acts which earn the believer a small deduction of time spent in purgatory in the afterlife. I thought of that as I walked around the stupa and gazed at the seated Buddhas, most in the Touch The Earth mudra associated with Siddhartha Gautama at the moment he became the Buddha, the Awakened One. 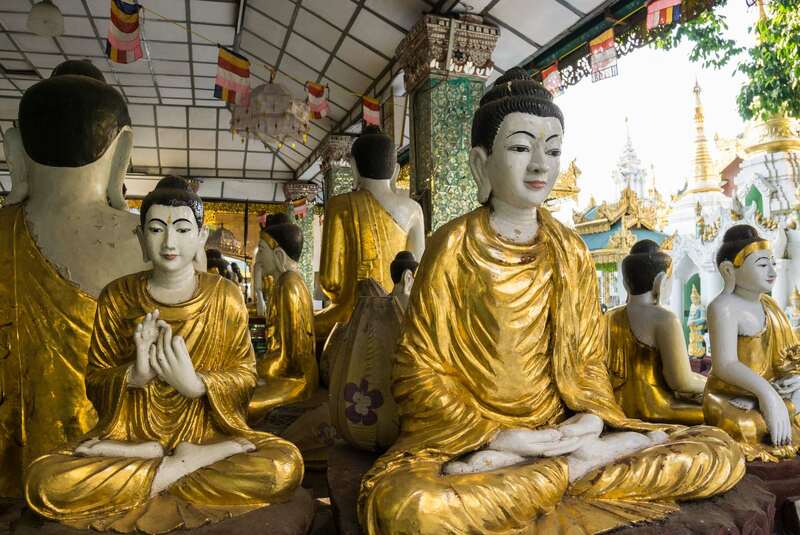 Looking at one Buddha figure – one indulgence. 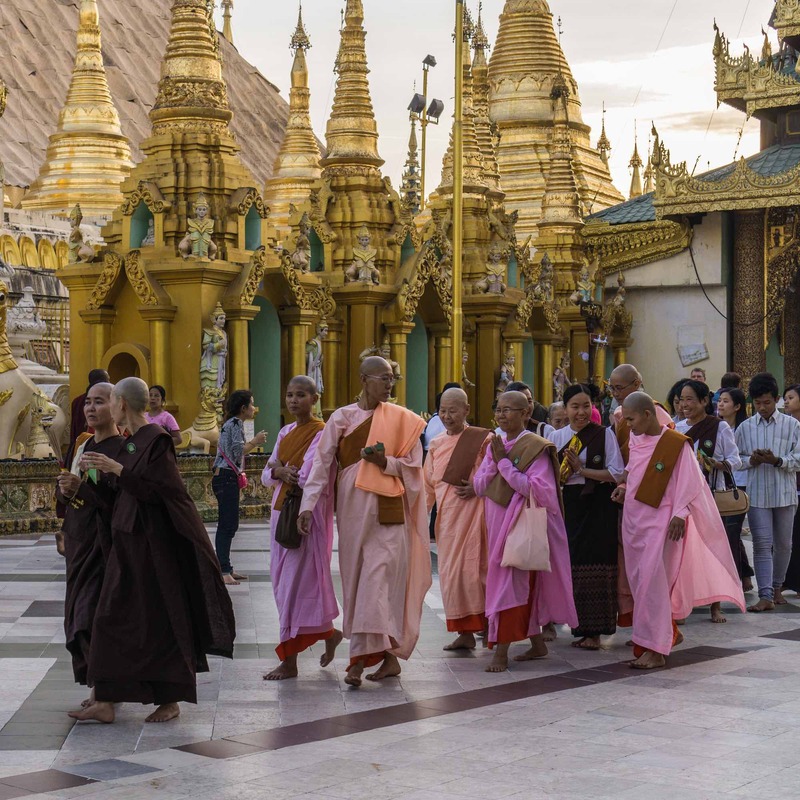 Hundreds and hundreds of Buddhas as I walked around the Shwedagon – much merit to be gained! The images above and the first few below were mostly taken in mid-afternoon on my first two visits. Blue sky and lots of light – and a fairly empty terrace as I walked around. It gave me time to get my bearings and to get an overall feel for the place. But as you scroll down you will notice less blue sky and more people – tourists, lay Buddhists, monks and nuns – popping up in the photos. 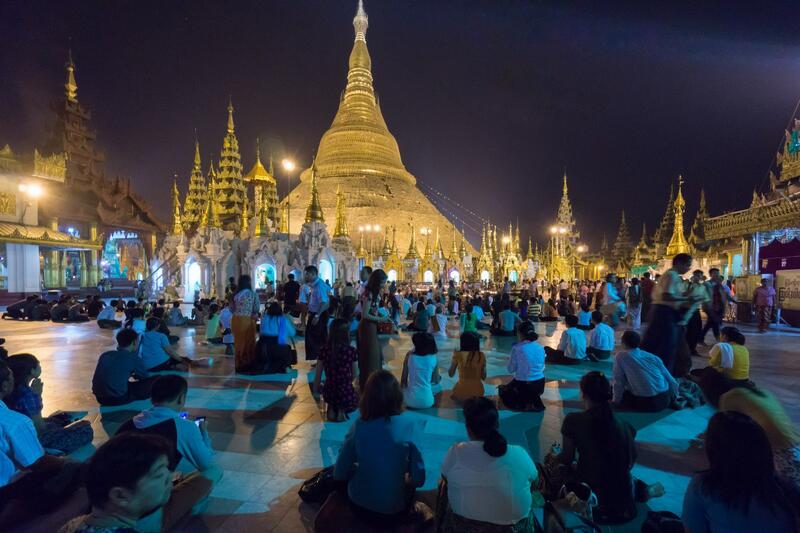 As dusk approaches the Shwedagon experience dial goes all the way to Full! I spoke briefly with the man on the bottom left. He asked me where I was from. I said “Canada.” He said, “I have a brother in Montreal.” Small world! He was a widower who came to this particular shrine most afternoons for a couple of hours. He asked me how I liked Myanmar. I told him it was so much more than I had expected. 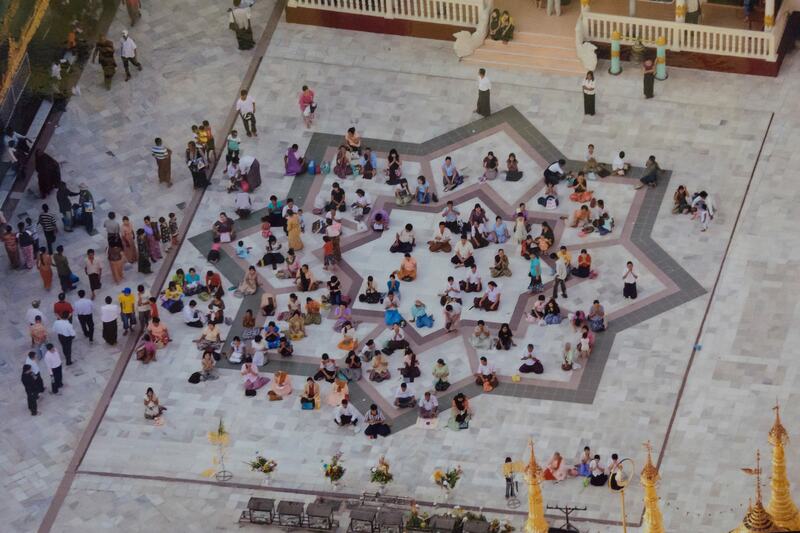 We wished each other all the best and I slipped back into the circular flow around the stupa. 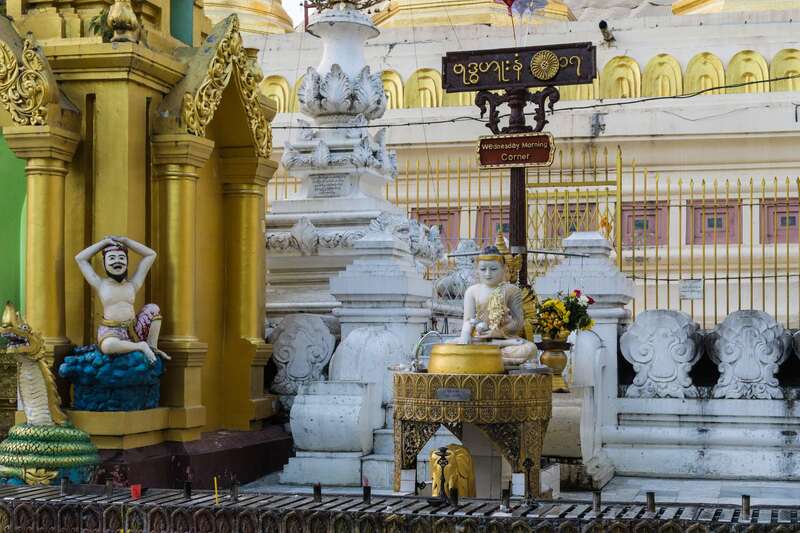 An important element of worship in Myanmar Buddhism are the shrines at the eight planetary posts. 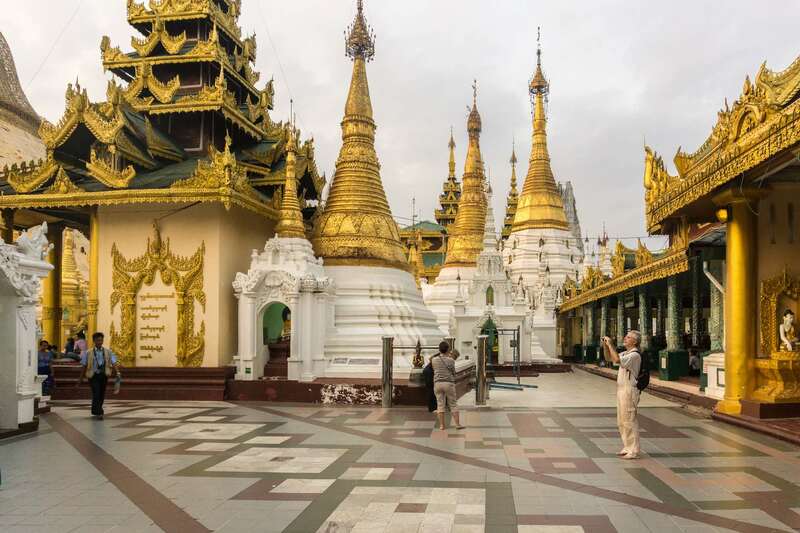 At the Shwedagon, they are arranged at intervals around the perimeter of the stupa, one post for each day of the week and with Wednesday divided into two days to give a total of eight. Local Buddhists will know the day of the week they were born on. 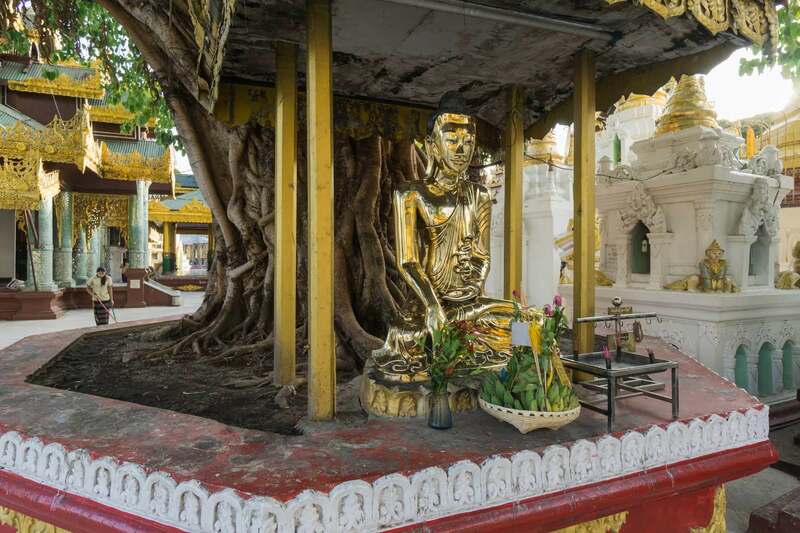 In the image above is the Wednesday post; those born on that day will do the required prayers, the ritual washing of the Buddha statue, and the leaving of flower gifts. It was very quiet in the mid-afternoon and it was only after the workday was over that activity at the planetary posts picked up. The collection of Buddha figures in the image below is interesting for the variety of hand positions or mudras on display. 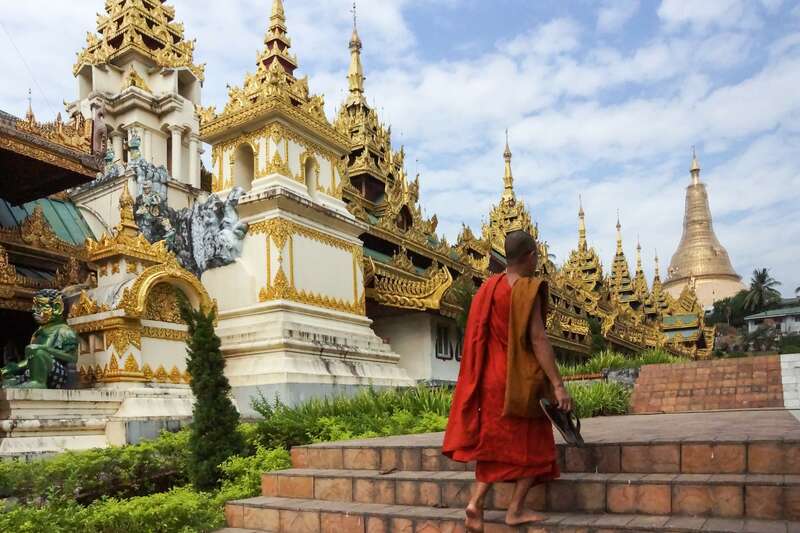 Each has a meaning understood by Buddhists; the most common in Myanmar is the mudra where the Buddha’s right hand touches the earth. It was the moment when he vanquished the power of Mara, the Evil One trying to deflect him from his mission as this age’s World Saviour. It reminds me of the Christian story of Jesus fasting in the desert and being tempted by Satan. In each case, their ministry begins after the temptation has been defeated. 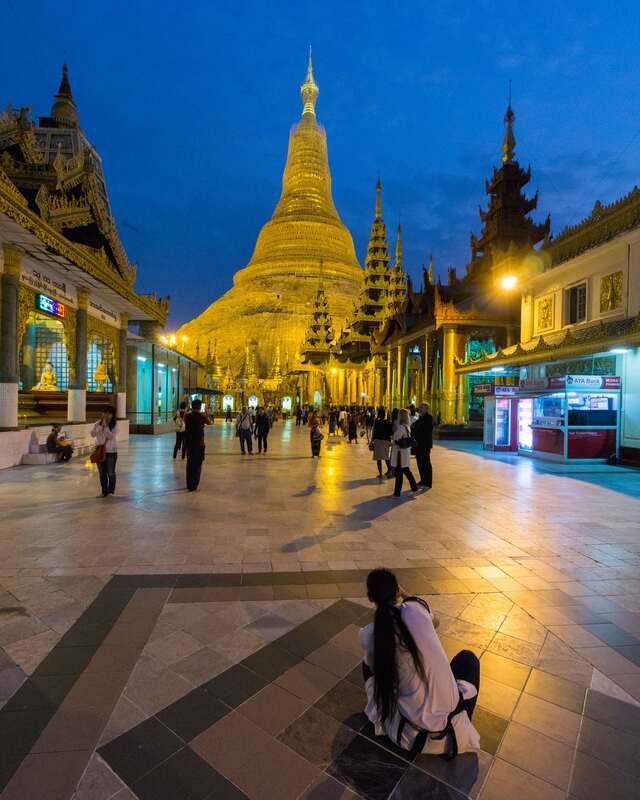 I visited Shwedagon on three different occasions – once in the morning and twice in late afternoon/dusk. I kept most of the nighttime shots for a second post (see the link below). 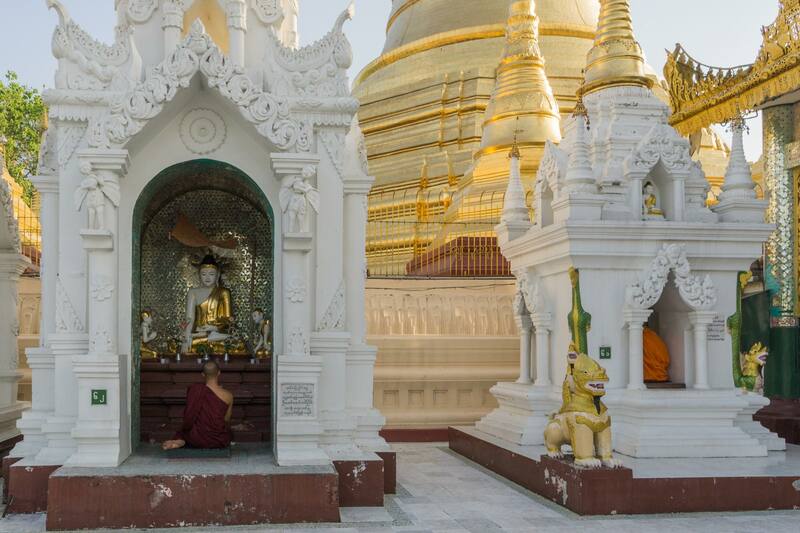 Make sure you head to the pagoda in the late afternoon for maximum atmosphere and the best photo ops! Le Huu Phuoc’s book Buddhist Architecture is available in Kindle format. Meio Nago, Okinawa provides some needed context. 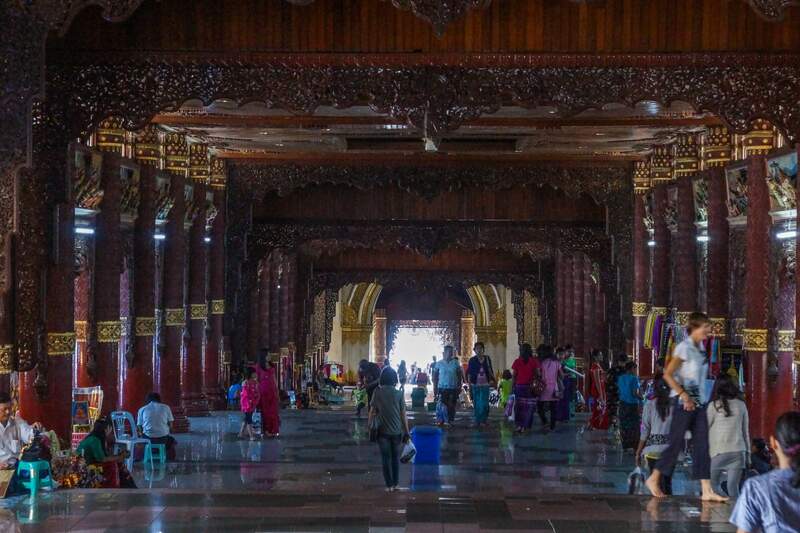 This entry was posted in Buddhism, Easy Travelling, Myanmar. Bookmark the permalink.